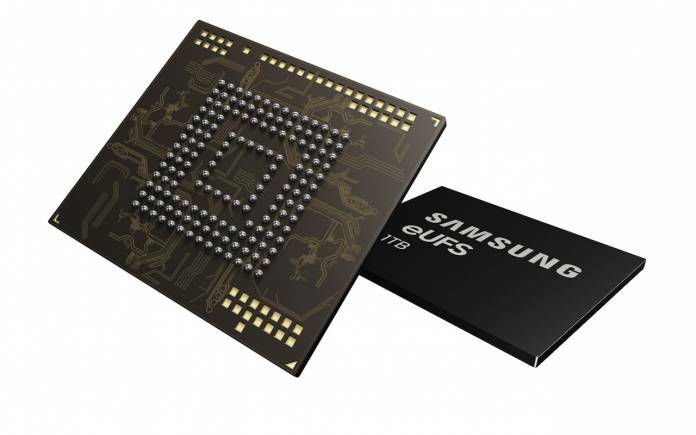 Samsung Announces 1TB eUFS 2.1 Storage Chip: Is It Bound For Galaxy S10 Plus? On Wednesday, Samsung announces its first 1TB UFS 2.1 flash memory chip for smartphones. The Company also announced that it’ll start offering the world’s first 1TB eUFS solution for phone manufacturers. For which the Company has started mass production already. This means that phones will be able to have 1TB of storage with a single flash memory chip. The 1TB chip for smartphone claims to be twice the density of Samsung’s previous top-end 512GB eUFS solution. It uses the eUFS 2.1standardsd and promises sequential read speeds of up to 1000MBps. Furthermore, the random reading speed has increased up to 38 percent compared to the 512 GB version, registering up to 58,000 IOPS. The new Samsung’s 1 TB eUFS solution maintains the same encapsulation size of 11.5mm x 13.0 mm. It doubles the capacity by combining 16 stacked layers of 512 GB V-NAND flash memory and a new development controller of its own. Smartphones users can enjoy a storage capacity comparable to that of a PC without having to use additional memory cards. All thanks to upcoming 1TB Samsung UFS 2.1. Although Samsung has not confirmed when the first phone with the new 1TB chip will arrive. As per rumors, you can expect Samsung UFS 2.1 (1TB) chip in upcoming Galaxy S10 plus. Even if, Samsung Galaxy S10+ won’t get 1TB of storage, it’s likely other vendors will want to launch 1TB mobile devices this year.